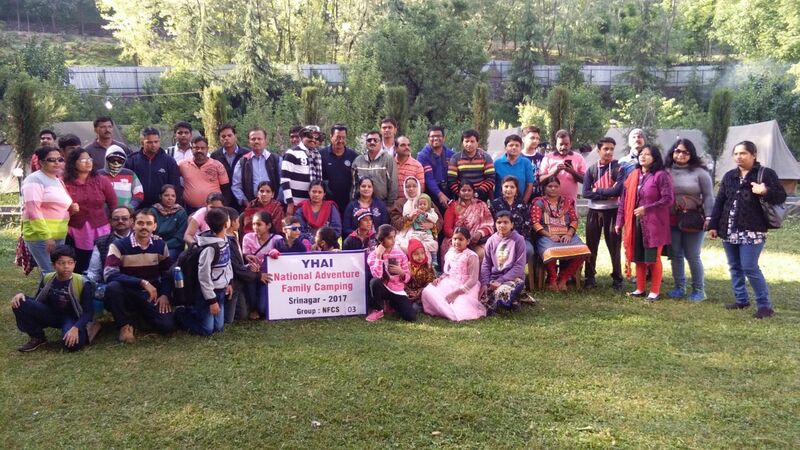 Youth Hostels Association of India has been organizing various adventure programs for the last 46 years. People from the poles apart cultures and regions participate in our programs and enjoy our economical and budgeted adventure programmes. A large number of volunteers work with dedication, and support us for running these programmes successfully. As a part of the Silver Jubilee Celebration of YHAI National Trekking, in 1995 we introduced the Family camping Program for the interested families. Similarly, once again we are conducting the National Family Adventure Camping program in Srinagar (Jammu and Kashmir). Note:-These programs are exclusively for YHAI members. Membership is also available at Base Camp/Online/State Branch/Units of YHAI. YHAI programmes are not subsidized by the Government or any donors. Kashmir is the northwestern region of the Indian subcontinent. Youth Hostel Association of India invites you to Discover and Explore the Ultimate Paradise on Earth, Cradled in the lap of majestic mountains of the Himalayas, Kashmir is the most beautiful place/valley on earth. One of the Mughal Emperor Jehangir has expressed Kashmir while visiting to this paradise. Our base camp is located very close to Harwan garden, which is about 21 kms from Srinagar and 03 kms beyond the Shalimar Garden in Srinagar district of Jammu and Kashmir. Harwan is one of the famous tourist destination . A beautiful canal, fed from a lake just behind the garden, passes through its center. The canal is bordered with blossoming flowerbeds and chinar trees. The main attraction of the Harwan garden of Kashmir, is its natural beauty that is present in plenty. The big lawns, carpeted with green grass, draw people towards this place. It also serves as a take-off point for visiting Dachi Gam Wild life sanctuary. * Program Includes: Simple vegetarian meals , One Family will be given one tent. Pahalgam is around 90 Kilometers from base camp and situated at an altitude of 7500 feet from sea level. The Lidder River running through it makes it even more picturesque. The best attractions of pahalgam are Betab Valley, Baisaran Valley ,Aru Valey, Zoo, Amusement park, Trout Fishing, Jamia Masjid, Mamal Temple, River Rafting etc. Gulmarg lies in a cup shaped valley in the Pir Panjal Range of the Himalayas, at an altitude of 9000 feet from sea level and around 70 km from base camp. The beautiful valley of gulmarg is famous for many attractions one of the best fascinating thing is World’s highest Car Cable Corporation (Gandola) which offers the interested tourists a wonderful view of kashmir valley at an altitude of 14200ft. Participants will be offered many places to visit like Dal Lake, Shikara Ride in Dal Lake, Nishat Garden, Shalimar Garden, Hazratbal, Chashmashahi, Tulip Garden, Pari Mahal etc. Final destinations will be decided on the spot as per demand and situation. Kashmir valley comprises about more than 3000 species of trees and plants. The plants of the western-side are well known for their medicinal properties it is a storehouse of medicinal and aromatic plants, which are used in pharmaceutical and perfume industries as raw material. It includes 55 species of important medicinal and aromatic plants. The fauna of Kashmir is diverse due to its unique location and climatic conditions. About 16% of the countries mammals, birds, reptiles, amphibians and butterflies are present in this valley. Kashmir valley is home of about 75-species of mammals, besides several sub-species, belonging to 54 genera, 21 families and 8 orders. Hangul and Snow Leopard that surviving there from times unknown. We can see many more fascinating and exquisite forms of life in many national-parks and sanctuaries that are present in the valley. Online Booking: Members desirous of joining this programme may apply online by paying requisite program fee along with online booking amount i.e. Rs.7500 (Online Charges extra) per Family including Husband, Wife and 2 Children upto age of 12 years. There is no refund applicable for the all the program bookings done after 10th April’2019. Refund may be given after the completion of the programme 30 to 50 working days. * Accommodation Facilities: Single tent will be provided to each family. Regular texi services on sharing bases are available from Lal chowk/TRC/Dal Gate, Srinagar to Harwan which takes around 20 minutes. Srinagar is connected to Jammu by road (300 km) which takes less than 08 hours and regular bus and texi service (Day and Night) is available From Jummu bus stand. Nearest Railway Station is Jammu Tawi (JAT) and nearest Airport is Srinagar (SXR). NOTE: There is no prepaid mobile service availability at in Kashmir region, only postpaid services are functional.